Here are some short videos we've taken of our birds! Windows Media Player (download here) works best to view them (PC users) and MAC users "might" try Quicktime . Other media programs should work as well. Please let us know if you experience any problems opening these files. If you are having trouble viewing these "streaming" videos, try "right clicking" on the URL to the video and save it to your desktop and then play it from there. Back in March 1998, just one year after adopting our first parrot, we were asked to participate in a news piece being put together by abc's 20/20. We provided about 5 hours of video of our birds doing day to day things in addition to the footage you will see in this video, filmed by 20/20. Please keep in mind when viewing this short excerpt of the 12 minute piece, we were very, very novice and said things that were rather silly, looking back now...I was such a dork! There were also some exaggerations by the correspondent as to the amount of time it took me to prepare meals & clean in addition to being put on the spot when asked what a monthly "tab" might be to care for our parrots (at the time was a tad high!) ....but they were trying to get a point across to viewers, that having parrots is truly a long term commitment and requires complete dedication! 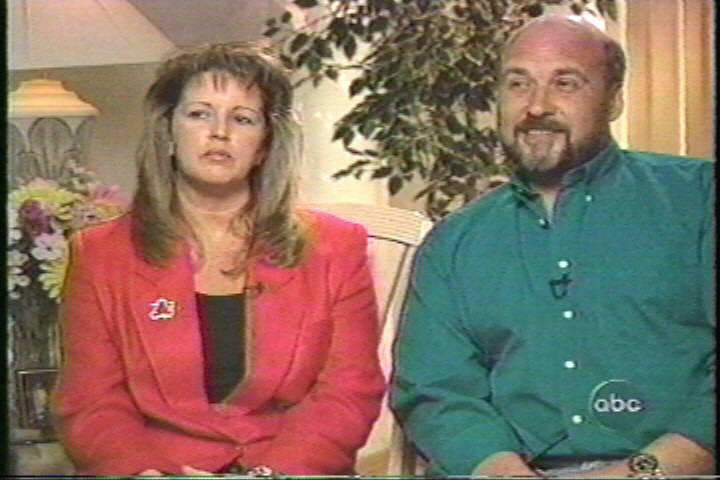 Here is the interview with myself and husband, from the piece "The Pecking Order", which aired on June 19, 1998. This is a 2.24 minute video. Dexter & Ollie (Dexter <left> & Ollie <right> become friends after 2 years) Taped thru glass door so not a real clear-focus video.